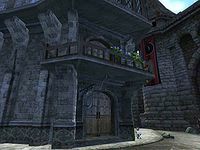 The West Weald Inn is an inn located in the northern half of Skingrad. It is found northeast from the West gate, next to Colovian Traders and across the street from the Fighters Guildhall. The proprietor, Erina Jeranus, buys potions and food while only selling the latter. The ground floor is the main reception area and bar while the rooms are upstairs. On the second floor is a counter and a door leading to the terrace while the rooms are on the third floor. Sinderion lives in the cellar. The room that you can rent is the second door on the left. It is spacious and very well lit, with a higher-class bed, wardrobe and writing table. There are also three other rooms on this floor, all of which are locked. The first and second to the right contain two beds and one bed, respectively, which are free to sleep in. Going down the stairs and into the main living space, you will pass four clutter barrels. A clutter cupboard sits in the corner on the right between two tables; one with silverware on, whilst the other servers as a dinner table. A loaf of bread, a wedge of cheese, as well as a pumpkin and two lettuces rest among a pewter pitcher and some cups. In the corner to the left of the dinner table stand five more clutter barrels. A bundle of garlic hang from each of the pillars on this side. The back alcove houses Sinderion's alchemy lab. An alembic, calcinator, mortal and pestle, and a retort sit on the worktop, along side a sample of void salts, root pulp and sacred lotus seeds. On the shelving unit of the alchemy area, a single sample each of daedroth teeth, white seed pods, frost salts, wisp stalk caps. Another clutter barrel stands next to the brewer. Sinderion's bed stands near the left wall, against multiple wine racks, holding a total of forty-six bottles of Surilie Brothers wine and twenty-one bottles of cheap wine. Another bottle of cheap wine can be found on the table in the middle of the room. On the shelving in the corner to the left of the wine racks, more silverware can be found, as well as three strawberries, three ears of corn, two apples, two loaves of bread and two heads of lettuce. A final clutter cupboard stands among the shelves. For both the Seeking your Roots and Alchemy Master Training quests you will have to seek out Sinderion, who lives in the basement. Esta página foi modificada pela última vez à(s) 07h01min de 21 de maio de 2015.